Buy All-in-one Brother MFC 5440cn with CISS with CISS and make 30 times more quality prints for the same money! Pay only 0.04 USD for A-4 full color print! brother printer mfc 5440cn of All-in-One series provides users with sufficient speed and productivity of work which is completely enough for any small-scale business or home. This comfortable brother mfc 5440cn printer is equipped with the documents autofeeder for 15 sheets that provides the accessible work of fax, allows copying, scanning and just printing of documents. The inner memory of the printing device may save up to 80 numbers of quick dialing and include up to 480 pages of scanned documents. Sent faxes are quickly enough, it takes about three seconds to send each page. brother printers mfc 5440cn like MFD Brother MFC-5895CW and Brother MFC-845CW gives ability to users to print full shaded, colorful photos directly from memory flash drives with the help of the given slots, direct connection through USB or interface with PictBridge. A comfortable wide screen, 3,3 inches LCD allows working with scanned or downloaded pictures and documents without coming back to your workstation or stationary computer. brother mfc-5440cn wireless inkjet all-in-one printer has a facility of simple connection of several users through Wi-Fi or standard Ethernet. It allows saving of scanned documents into files or sending of e-mail by pressing one button without interaction with a stationary personal computer or a laptop. Innovational optical facilities of MFD Brother MFC-5440CN allow transformation of paper documents into a text which can be edited. 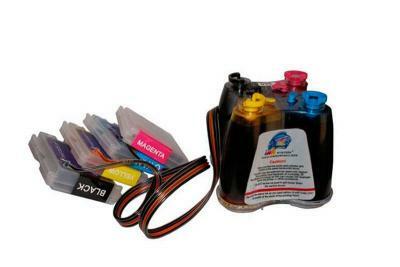 A unique 4-colored cartridge allows to save lots of money. The ink block construction consists of four tanks; each of them has its ink color. By emptying of one tank you don't have to substitute the whole block, you only have to substitute only the one which is empty. Brother MFC-5440CN multifunction printer is a remarkable assistant at any home, small or middle-sized office and even at University or other educational establishment that was found out by the universities workers in such cities as New-York, Florida, Las-Vegas, Los-Angeles, Texas. The control panel has common design with fax on its left side and functional navigation keys with buttons in menu on the right-hand side, you can also see start and stop buttons of copying or scanning there. There is a wide-screened, colorful LC-display with 84 mm diagonal in the middle. A wide screen allows moving through the menu and looking through small images simultaneously. Below the control panel there is a paper tray for 100 sheets which has an inbuilt into the cover tray for 20 photo paper sheets. To add the paper to the tray you should take out the main paper tray and move photo paper tray forward to let it go out. 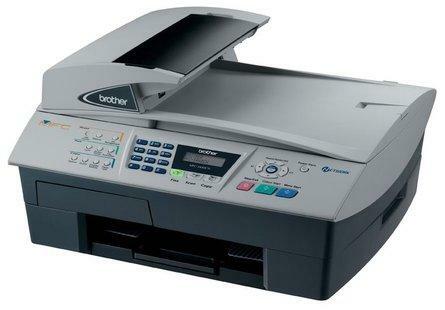 Brother MFC-5440CN is a representative of a compact and stylish color ink-jet printer of All-in-One series which has an auto feeding mechanism for 15 sheets that is very comfortable for the automatic work of fax, copying or scanning. It also offers the facility of several users connection simultaneously using Wi-Fi interface (802.11b/g) or wired (Ethernet) network connection. A convenient wide format 3,3 inch color LC-display supports the menu work and the facility of photo quality improvement without PC usage. Carton Dimensions (W"xD"xH")	21.7" x 18.0" x 15.1"
Carton Weight (lbs)	22.0 lbs. Unit Dimensions (W"xD"xH")	18.1" x 17.0" x 10.6"
Unit Weight (lbs)	16.5 lbs.